Samson's BT4 telescoping boom stand combines lightweight durability with an attractive and functional design. 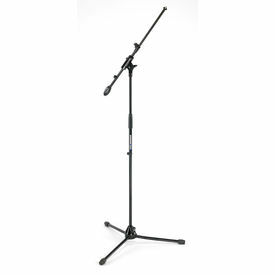 This collapsible tripod mic stand has a sturdy die-cast and steel construction that offers superior resiliency with great flexibility of positioning, so it's always convenient and never conspicuous. And its sleek black finish ensures an elegant yet understated presence, making it perfect for on-the-go musicians, performance venues and rehearsal/recording spaces.